Contemporary apprentices Justice Jones and Kachina Henry (left and center, respectively) interview visiting artist Kealeboga Tlalang. Photo by Riché Effinger. This month, South African mixed media collage artist Kealeboga Tlalang is here to lead an artist residency and to partake in his first U.S. solo exhibition (on view in the JXTA Gallery through November 10). 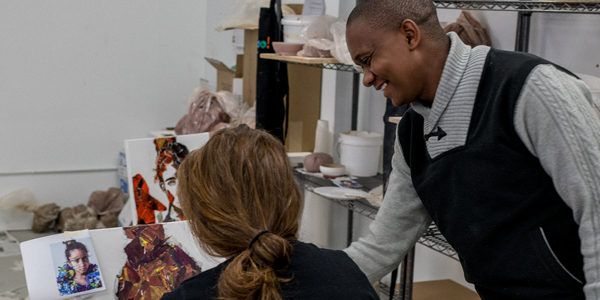 In addition to the exhibition, from September 20 to September 27, Kealeboga led an artist-in-residency with the apprentices in the Contemporary Art Lab. 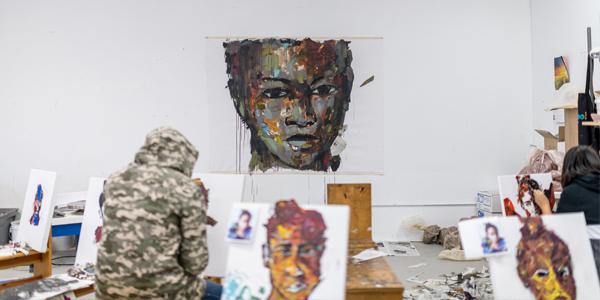 Under Kealeboga’s instruction and by following his lead as he created his own large-scale collage portrait, apprentices explored multimedia collage techniques. Using a single portrait photo as a reference point, they all began their work by sketching outlines in charcoal. 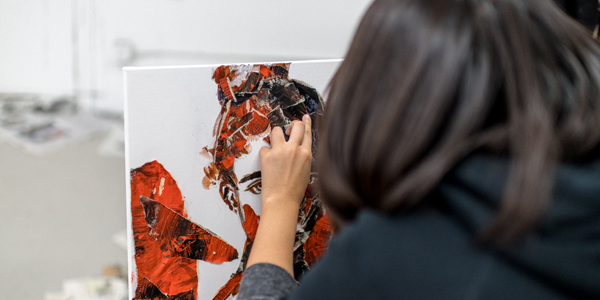 To add texture and depth, they ripped up (all local) newspapers and used paint to add splashes of color and produce their own interpretations of the portrait. 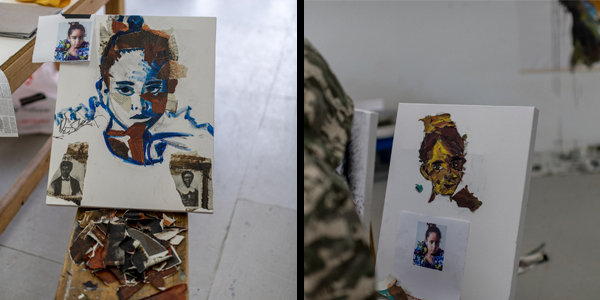 The result was a varying range of work, every piece showcasing each apprentice’s style and flair while also adhering to a unique art-making approach. During this residency, Contemporary apprentices Kachina Henry and Justice Jones sat down with Kealeboga to ask him a few questions about his work and life. Read the full interview below, and if you’re interested in learning more, don’t miss Kealeboga’s artist talk on Thursday, October 4th at 7PM in the JXTA Gallery, 2007 Emerson Avenue North. The event is free and open to the public. The following interview was recorded and edited for clarity and accuracy. JXTA Apprentices: Who are you? Where are you from? Kealeboga Tlalang: I’m Kealeboga. I’m from South Africa. I’m based in Johannesburg. J.A. : This is your first solo U.S exhibitio; what are you most excited about? K.T. : What is exciting is that this is my first-ever solo show. J.A. : How did you get connected to JXTA? K.T. : I think it was through a friend, her name is Erica. Erica came to South Africa. I think she came for a business tour and she came across a homeowner magazine because she was looking for interior designers. There she saw my work and said, “You know what, I want to find this guy,” and came looking for me. We met and she wanted to buy a piece of art from me. Unfortunately, I had no pieces for sale back then, so she decided to commission art for herself. Ever since then she’s been getting calls from friends that love my work. She then introduced me to both Roger and DeAnna Cummings and Kevin Winge and we all came up with the idea of my visit to the U.S. for an exhibition and residency. J.A. : That’s awesome. So how long have you self-identified as an artist? K.T. : I would say I was very young , around three years old, when I discovered my talent. Lucky for me, I have an uncle who does sculptures. I watched him and that’s how I fell in love with art. From there I started doing my own sketches and drawings. J.A. : Tell us about your creative process. K.T. : First of all, I need a reference to work from. Then, I sketch a picture with charcoal. After that, I cut small pieces of newspaper and use this as the base for the collage-work. From there I paint over the charcoal and newspaper. J.A. : Do you teach often? What has the residency with JXTA’s Contemporary Art Lab been like for you? K.T. : I’ve never taught anyone how to draw or collage ever in life. I never had the time. I spend most of my time in my studio; like 14 hours a day, Monday to Sunday. I never have time to teach so I’m blessed to be here now. I’ve gotten to learn from some of the apprentices because they’re really talented. I’d love to take this opportunity and experience back home and go to schools and talk to students about how to create something out of nothing. Contemporary Arts Lab apprentices works-in-progress. Photos by Riché Effinger. J.A. : You’ve talked about a connection between art and math in your work. How is it visible? K.T. : It’s still a work in progress. I’m working on some pieces now to show how they correlate. J.A. : What has been the most surprising thing about your visit to Minnesota/the United States? K.T. : There’s no difference from me being here and back home in South Africa. The people have been amazing. It’s been great working with the apprentices. I can do this more often. J.A. : Anything else you want to tell us? K.T. : Next year I have 2 solo shows. I’m going to France and I’m going to the UK. I’m super excited. I want to give back and tell people they can make a living being creative. RSVP to Kealeboga Tlalang’s Artist Talk on Thursday, October 4 at 7PM HERE. “Kealeboga Tlalang” will be on view in the JXTA Gallery (2007 Emerson Avenue North) until November 10.